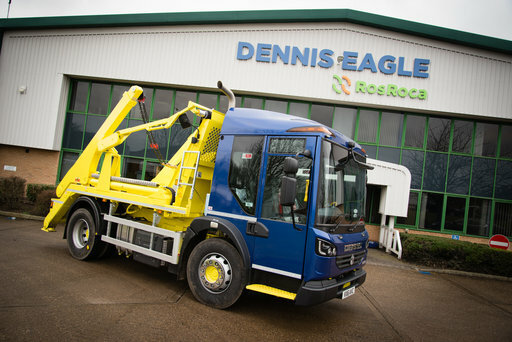 Cyclear™ and the RX3 Hard Disk Recording camera system from leading vehicle safety technology experts, Innovative Safety Systems Ltd (ISS), feature on the Dennis Eagle Skip-loader vehicle, which is taking centre stage on Totalkare’s stand at The CV Show (26-28 April 2016). Dennis Eagle launched its new urban skip-loader vehicle specifically for the construction market and the innovative model is being trialed by operators this spring as part of Transport for London’s (TfL) Construction Logistics and Cycle Safety (CLOCS) project. The vehicle comprises the company’s low-entry Elite 6 4x2 chassis fitted with skip-loading equipment. The vehicle has been fitted with the latest safety enhancing technologies including Cyclear™, a Cyclist Safety Warning Display System from ISS. Viewed by many as the most effective cyclist warning display system for HGV’s, Cyclear™ has already been adopted by national waste operators such as Serco, Amey and Biffa. A left hand indication from the driver triggers an internationally recognised bicycle ‘strike through’ sign on the rear of the vehicle to illuminate along with an audible “Caution Vehicle Turning Left” sounded to alert cyclists and pedestrians of the driver’s intended left turn. At the same time an intelligent sensor system mounted along the nearside of the vehicle will alert the driver if a cyclist chooses to undertake the vehicle into their blind spot. The RX3 Hard Disk Recording system has a proven track record in reliability and can accommodate up to 16 cameras and 2 audio inputs. Key features include speed, XYZ acceleration and GPS positioning. The RX3 system works in harmony with LANlink, a cost effective and reliable remote footage download facility that uses WiFi when vehicles return to the depot, eliminating the need for the removal of footage directly from the vehicle. LANlink also sends a daily vehicle health check to any number of recipients so that any faults with the system or cameras are identified immediately. For further information about Cyclear™ or other ISS products and services tel:02476 442699 or visit www.iss-international.co.uk.